The train is powered by a locomotive that pulls three passenger cars. The train comes complete with a Conductor, Seat-belts, Horn and Train sounds. Train has a gas motor and can only be used outside. 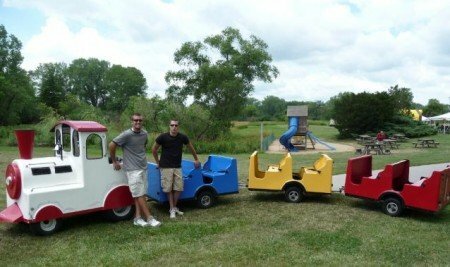 Our 3 car Trackless Train Rental is ideal for company picnics, school events, Church Events and Christmas holiday events. This train is designed to hold young children through adults. Trains always produce excitement in kids and adults. The train is painted in bright primary colors. Comes with a train bell which will draw attention to it as it travels around your venue.